SARS is caused by a member of the coronavirus family of viruses (the same family that can cause the common cold). It is believed the 2003 epidemic started when the virus spread from small mammals in China. When someone with SARS coughs or sneezes, infected droplets spray into the air. You can catch the SARS virus if you breathe in or touch these particles. The SARS virus may live on hands, tissues, and other surfaces for up to 6 hours in these droplets and up to 3 hours after the droplets have dried. While the spread of droplets through close contact caused most of the early SARS cases, SARS might also spread by hands and other objects the droplets has touched. Airborne transmission is a real possibility in some cases. Live virus has even been found in the stool of people with SARS, where it has been shown to live for up to 4 days. The virus may be able to live for months or years when the temperature is below freezing. With other coronaviruses, becoming infected and then getting sick again (re-infection) is common. This may also be the case with SARS. Symptoms usually occur about 2 to 10 days after coming in contact with the virus. In some cases, SARS started sooner or later after first contact. People with active symptoms of illness are contagious. But it is not known for how long a person may be contagious before or after symptoms appear. In some people, the lung symptoms get worse during the second week of illness, even after the fever has stopped. Initial symptoms are flu-like and may include fever, myalgia, lethargy symptoms, cough, sore throat, and other nonspecific symptoms. The only symptom common to all patients appears to be a fever above 38 °C (100 °F). SARS may eventually lead to shortness of breath and/orpneumonia; either direct viral pneumonia or secondary bacterial pneumonia. Travel to any of the regions identified by the World Health Organization (WHO) as areas with recent local transmission of SARS (affected regions as of 10 May 2003 were parts of China, Hong Kong, Singapore and the town of Geraldton, Ontario, Canada). 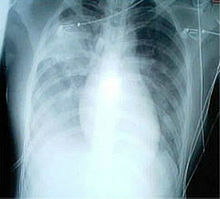 For a case to be considered probable, a chest X-ray must be positive for atypical pneumonia orrespiratory distress syndrome. The World Health Organization (WHO) has added the category of "laboratory confirmed SARS" for patients who would otherwise be considered "probable" but who have not yet had a positive chest X-ray changes, but have tested positive for SARS based on one of the approved tests (ELISA, immunofluorescence or PCR). When it comes to the chest X-ray the appearance of SARS is not always uniform but generally appears as an abnormality with patchy infiltrates. Antibiotics are ineffective, as SARS is a viral disease. Treatment of SARS is largely supportive with antipyretics, supplemental oxygen and mechanical ventilation as needed. People with SARS must be isolated, preferably in negative pressure rooms, with complete barrier nursing precautions taken for any necessary contact with these patients. Your health care provider may hear abnormal lung sounds while listening to your chest with a stethoscope. In most people with SARS, a chest x-ray or chest CT show pneumonia, which is typical with SARS. All current tests have some limitations. They may not be able to easily identify a SARS case during the first week of the illness, when it is most important. People who are thought to have SARS should be checked right away by a provider. If they are suspected of having SARS, they should be kept isolated in the hospital. There is no strong evidence that these treatments work well. There is evidence that the antiviral medicine, ribavirin, does not work. The death rate from SARS was 9 to 12% of those diagnosed. In people over age 65, the death rate was higher than 50%. The illness was milder in younger people. Many more people became sick enough to need breathing assistance. And even more people had to go to hospital intensive care units. Public health policies have been effective at controlling outbreaks. Many nations have stopped the epidemic in their own countries. All countries must continue to be careful to keep this disease under control. Viruses in the coronavirus family are known for their ability to change (mutate) in order to spread among humans. Call your health care provider if you or someone you have been in close contact with someone who has SARS. Reducing your contact with people who have SARS lowers your risk for the disease. Avoid travel to places where there is an uncontrolled SARS outbreak. When possible, avoid direct contact with people who have SARS until at least 10 days after their fever and other symptoms are gone. Hand hygiene is the most important part of SARS prevention. Wash your hands or clean them with an alcohol-based instant hand sanitizer. Cover your mouth and nose when you sneeze or cough. Droplets that are released when a person sneezes or coughs are infectious. DO NOT share food, drink, or utensils. Clean commonly touched surfaces with an EPA-approved disinfectant. Masks and goggles may be useful for preventing the spread of the disease. You may use gloves when handling items that may have touched infected droplets.